As a certified and insured mold removal and inspection company – and Michigan’s leader in chemical free mold remediation – it’s our job to help you remove any mold and restore your home. We use a combination of methods to ensure that your home is free from contamination and the indoor air quality is completely restored. Here are some of the genuinely effective services we use to return your home to a safe ecological condition. Your safety and health is very important to us. MoldPro provides total peace of mind that your remediation has been done correctly, and we can back up that claim with independent lab air testing. With independent mold clearance testing, you can be assured that your home has been returned to a normal, healthy, ecological condition. We can do two types of mold air testing, mold spore testing and lift tape sampling. Mold Spore air testing is usually used to test the air on a floor of the home (basement, first floor-second floor, etc.) or in a given area of the home. It helps to define where the mold concentrations are highest in the home and identify where to focus the remediation. The main benefit of dry ice blasting is that there are no chemicals used; there are no long-term chemical effects. It is clean and approved for use even in the food industry. With dry ice blasting, the mold is actually removed from the home, whereas other processes leave the mold intact and free to regrow. Please note that the dry ice pellet changes from a solid to a gas almost instantaneously upon impact. Dry ice blasting is the safest, most thorough and advanced method of mold remediation today. If you’re experiencing health challenges due to mold in your home or place of business, MoldPro offers an additional treatment that will break up mycotoxins from your home. Mycotoxins are invisible gases that are harmful to your health. They are formed by mold colonies to protect themselves from other competing mold colonies. Treating with a natural, ethanol water solution will help to break down and remove mold mycotoxins. All hard surfaces including all walls, floors and ceilings are wiped down with an ethanol water solution. In addition, cabinets and hard surface furniture are fogged. Cabinets will have this solution scrubbed into the grain. Upholstered furniture will be thoroughly dampened with the solution. Fogging helps to clean the air and to break up and remove mold mycotoxins. Fogging takes an AeroSolver Pure solution and atomizes it into the air. This procedure shoots a significant amount of the solution into the air in a short amount of time, and the solution permeates areas that would normally not be permeated. Using a HEPA (High Efficiency Particulate Air) vacuum removes 99.97% of all contaminants down to .03 microns. After the dry ice blasting process is complete, the entire area is vacuumed to pull up mold spores and other contaminants. This further aids in the remediation process. Treating the air with Ozone is another extensive service we offer if you are having health challenges due to contaminated air. Ozone is a naturally occurring gas and is the second most powerful sterilant in the world that can be used to destroy bacteria, viruses and odors. This treatment replicates what happens in the air during a lightning strike. When contaminants such as odors, bacteria or viruses make contact with ozone, they are destroyed completely by oxidation. 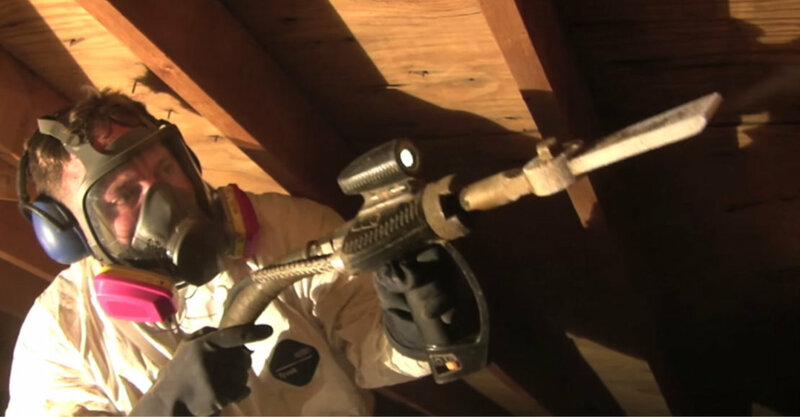 Removing insulation can rid the home of potentially harmful chemicals, animal feces and other contaminants. Your compromised insulation will be removed and new formaldehyde-free insulation will be installed. Whether you have rolled or blown-in insulation, removal is done in a manner to keep contaminants from entering the living area. Air inside the home is filtered through a three-stage HEPA filter. Exhaust air is sometimes vented outside the home to aid in cleaning the indoor air. All air is filtered down to .03 microns and is 99.97% clean of contaminants. We have years of experience working with homeowners to test and eliminate mold, and return homes to a safe ecological condition. We understand the need for indoor air quality to be healthy so that families are not breathing harmful air contaminants. However, as a certified chemical-free mold remediation company, we know that many techniques used today will not get to the root of the mold and will actually further deteriorate a home’s physical and ecological condition. We remove the source of the contamination and restore the indoor air quality at competitive rates with methods and materials that are genuinely effective and safe. We will not use harmful chemicals to “treat” or “remove” the mold from your home. Instead, our philosophy is to remove the source of the contaminant to insure complete remediation has taken place.